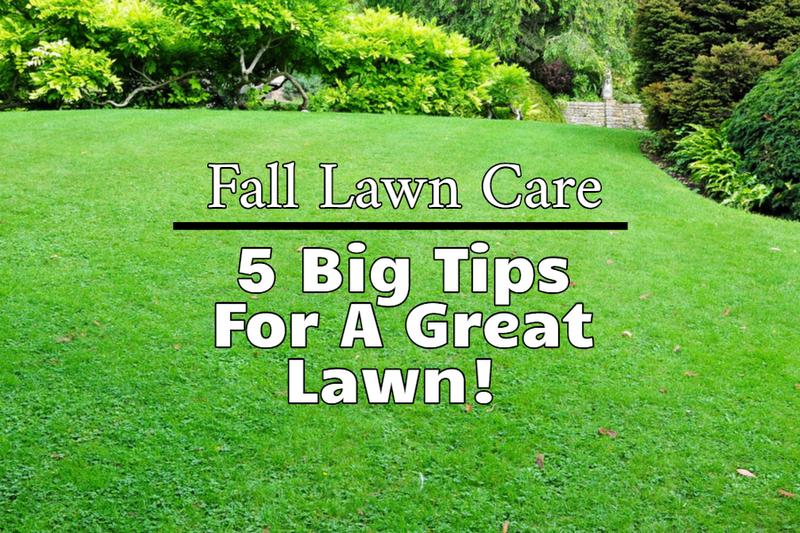 5 Fall Lawn Care Tips To Get Your Grass In Great Shape! If you are looking to get your lawn in tip-top shape – we have you covered with our 5 must-do fall lawn care tips! Fall is the perfect time to get your turf looking lush, green and beautiful. The cool autumn weather is ideal for repairing, reconditioning and revitalizing lawns left damaged from the stress of summer. Here is a look at our 5 must-do lawn care tips to get your lawn back in top form. Bare spots can easily be repaired in the fall. Summertime heat, along with wear and take from heavy foot traffic takes its toll on a lawn. Bare spots and damaged turf can leave a yard looking less than desirable by late summer. Making it worse, those bare spots are an open invitation for weeds to settle in. But fall is the ideal time to get all of those empty patches fixed. The cooler weather and dew-filled mornings are a perfect combination to germinate seed. Start by digging up bare spots and adding in a bit of compost or topsoil to the top few inches of soil. Remove and dead or damaged turf from the soil. Use only good quality seed, and sow heavily. Rake the seed gently into the soil, and water. Cover the newly seeded soil with straw or a thin layer of peat. This will help to keep the soil moist, and keep birds and pests from consuming the seed. Water every few days until the seed germinates. Once the seeds sprout, continue watering twice a week until fully established. Do not over-water. Too much water will keep the roots at the surface. Deeper roots mean a stronger stand of turf. Do not mow until the seed is heavily established, usually around 4 to 6 weeks. Mow grass higher in the summer, and back lower in the fall. Although cutting the grass higher during the summer is a good idea to conserve moisture, lawns need to return back to a more normal height in the fall. Cutting lower in late fall and before winter sets in is pivotal in keeping lawns healthier. Leaves and snow that can cover the ground through fall and winter easily become trampled and matted. This compression can cause bare spots and make it easy for disease and mold to take hold. For most typical lawns, grass should be mowed at a height of 3.5 to 4 inches in late spring and summer. In the fall however, grass should be cut back to near 2.5 inches. This is high enough to keep it protected from both weed seeds and the weather, but not so high to compress with a coating of leaves or snow. Speaking of leaves, it is important to keep Fall’s falling foliage cleared enough so your lawn isn’t suffocating. Leaves, especially ones that become thick and wet, can easily snuff out grass below. Rake or vacuum leaves at regular intervals to prevent lawns from getting choked out. And whatever you do, don’t burn or throw those valuable leaves to the curb! Leaves are a wonderful addition to the compost pile. You can also shred them and use them as mulch over the garden, and to protect vulnerable perennials through the winter. A thick coat of leaves may look pretty, but it can damage a lawn. Overseeding is one of the best ways to thicken and protect a lawn. And its easy to do. Overseeding is the process of planting new grass seed into an existing lawn. There is no need to till or remove the existing grass. Overseeding should be done at least 45 to 50 days before your areas typical first frost. This allows enough time for the seed to germinate and become established. The easiest way to overseed is to mow the lawn down to 2.5 inches, and then use a drop or broadcast spreader to spread seed. You can also use a slit or drill seeder to lightly “plant” the seed in the ground. You can find slit seeders at most home and garden tool rental stores. Finally, Autumn is the perfect time to give your lawn’s tired soil a boost of nutrients. Feeding lawns in early to mid-fall not only greens them up now, but allows them to green up faster next spring as well. If you are looking for an all-natural solution in place of commercial fertilizers, try using compost. Lawns can be top-dressed the fall with a 1/8″ to a 1/4″ thick layer of compost. Simply use a drop spreader on a wide open setting to lay down a thin coat. The compost will settle down in the top layer of soil, feeding as it decomposes. The added benefit of compost fertilizing is that you are adding organic material to your topsoil as well. You will be amazed at the results! June 9, 2018 TIMG Comments Off on Purple Perennials! 4 Great Plants To Add Purple To The Landscape!